RayBio® Human/Mouse/Rat Angiotensin II EIA Kit optimized for serum. Competition-based ELISA on a 96-well strip plate. Specificity: This kit can theoretically detect all active angiotensins, including ANGI, ANGII, ANGIII and ANGIV as well as inactive angiotensinogen. 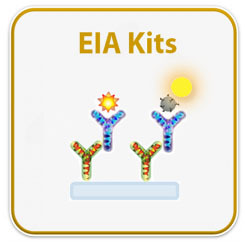 Cross Reactivity: This EIA kit shows no cross-reactivity with any of the cytokines tested: Ghrelin, Nesfatin, NPY and APC. Prepare all reagents, samples and standards as instructed. Add 100 µl detection antibody to each well. Incubate 1.5 h at RT or O/N at 4°C. Add 100 µl standard or sample to each well. Incubate 2.5 h at RT. Add 100 µl prepared streptavidin solution. Add 100 µl TMB One-Step Substrate Reagent to each well. Add 50 µl Stop Solution to each well. Read plate at 450 nm immediately. 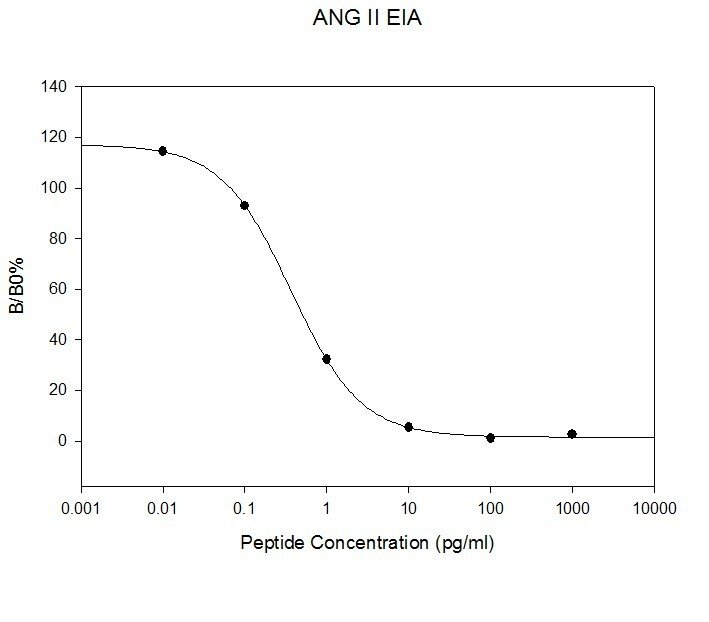 Standard, Biotinylated Angiotensin II peptide, and Positive Control should be stored at -20°C after arrival. Avoid multiple freeze-thaws. The remaining kit components may be stored at 4°C. Opened Microplate Wells and antibody (Item N) may be stored for up to 1 month at 2° to 8°C. Return unused wells to the pouch containing desiccant pack and reseal along entire edge.